This sink has smooth contemporary lines with a slot drain in the rear. This sink was designed using the golden ratio, the calculation that was used 3,000 years ago on structures like the Greek Parthenon. Water flows from the faucet into the curved bowl and then into a slot drain. 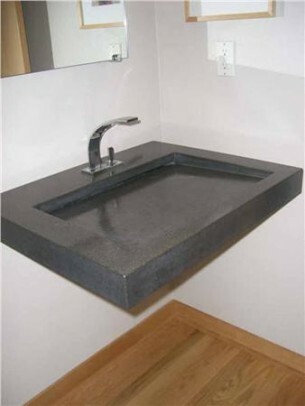 This sink is made with reinforced concrete and 35% recycled content. The Notebook sink weighs 125 pounds and can be mounted in a variety of settings; as a vessel sink on an existing cabinet or even mounted on the wall as shown in the image above. For wall mounting, separate square tube steel brackets with mounting holes for bolting to the studs are available at additional cost, please call for more information. This sink is available in several colors and color styles. In addition to the colors available, customers have the option of customizing their sink to match a paint swatch or specified color; please call for custom coloring.